Holiday Ordering Made Easy with Roma! We know you’re entering your most important sale season! Sometimes, it seems there aren’t enough hours during the week, so why not place your orders on a Saturday? We are positively committed to delivering on our #1 Core Value: Delivering WOW through Service, and our Wizards of WOW will be available on Saturdays to chat with and assist you, our awesome partners, with order processing and inquiries. Saturday hours are back: Our Wizards of WOW will be available on Saturdays, beginning November 28 until December 19 from 10am to 8pm (EST). 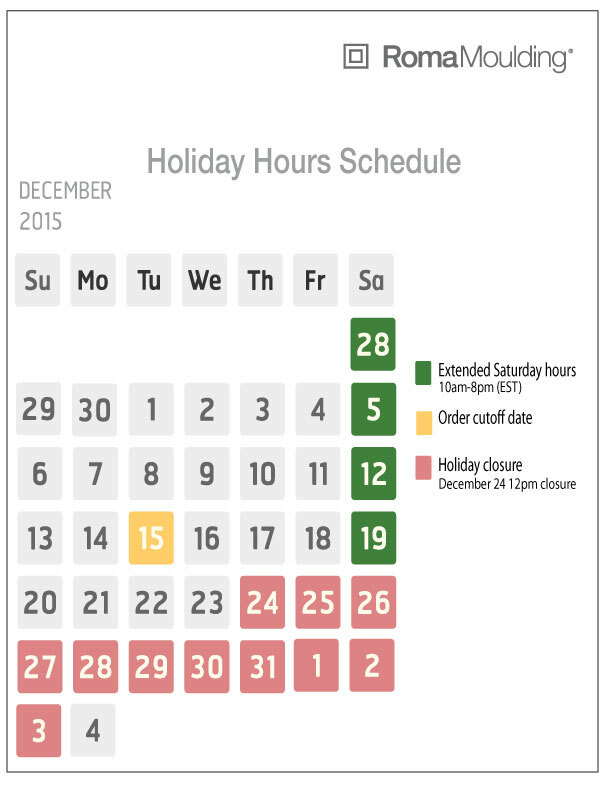 Holiday order cutoff date: Mark December 15 in your calendars. Remember to place all your orders to ensure shipment in time for your holiday orders. You can place orders after December 15, and we encourage you to call and inquire about our expedited freight service options when placing your orders to ensure delivery. Roma holiday break: Our Roma Offices will be closed during the holiday season from 12pm December 24 and reopening on Monday, January 4. For your convenience, below you will find a downloadable version of our scheduled hours of operation to print and post as a reminder. Give us a call; we can’t wait to hear from you!